I love to use my crochet skills for good. And the best good is giving cute, handmade gifts. It's not without anxiety though. After spending hours getting your blanket, scarf or toy exactly so, packing it up ready to give to the lucky recipient, a doubt creeps across your mind. What if they notice that the eyes aren't perfectly level or that you missed that stitch on row 34? Or worse, what if they just don't like it? The more gifts you give however, the better it feels. People are generally so pleased that you took the time and effort to handmake a gift for them, that they don't notice the slight mistake that is all you can see. Besides, as with most things, you are your own worst critic. I bet if you actually asked someone to point out the mistakes, they wouldn't even be able to find them. I made him from this pattern, I Love Buttons by Emma. 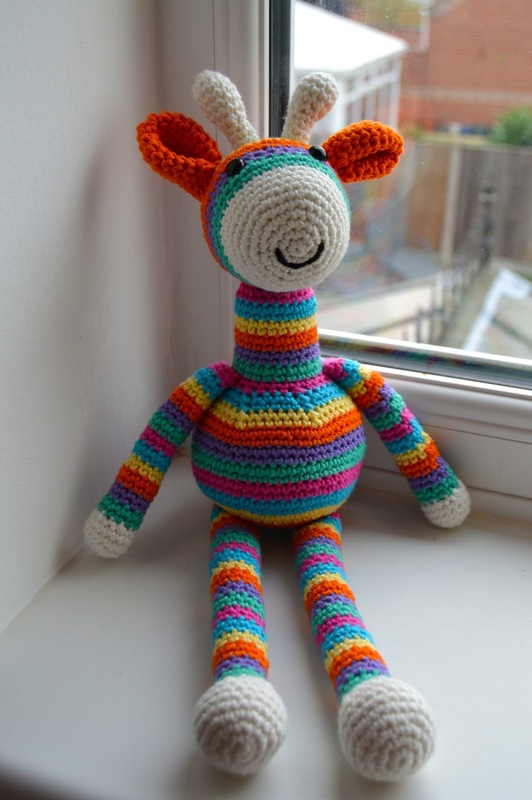 It's a pretty popular one, lots of these giraffes floating around Ravelry, but that's probably because it's a nice easy pattern to follow and gives you the cutest baby gift. I didn't follow the colour scheme suggested in the pattern exactly, so I spent some some time beforehand working out how many colours would work for the number of rows, as I wanted the stripes to match up on the legs, arms and body. I also made a few other adjustments; I shortened the length of his horns (fact of the day, apparently these are really called 'ossicones') as they seemed a bit too long to me. I added a little fluffy tail, and I extended the length of his legs so he looked like a proper giraffe. I always have a dilemma over safety eyes; they look loads better than stitched eyes and officially they are 'safety eyes' so should do what they're supposed to, but I always feel I need to mention that the eyes shouldn't be swallowed, just in case. I packed the giraffe up with some floral (Cath Kidson inspired) dribble bibs and some dog treats for Tic Tac and sent them off to my friend, hoping they would bring her new little family some enjoyment in her home town up North. It was also my bestest buddy's 30th birthday recently. 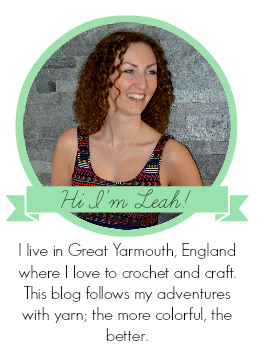 She too has the crafting bug (although she is a dirty knitter, but I'm trying to get her over to the dark side!) and asked if we could go to a craft class together for her birthday. My answer was of course yes! That sounds like a win-win situation to me; a birthday present that I get to enjoy as well! 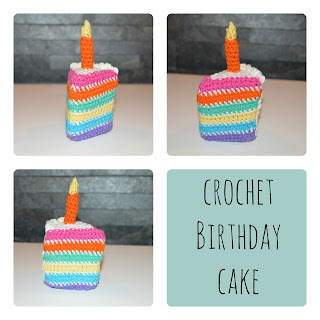 So that she had a little something silly as a present on the day, I made her a slice of birthday cake, crochet of course. Stupidly, I used two different types of cotton, one slightly thinner than the other I eventually realised) and so the slice was a little squiffy. Not my bestest work, but I was on a time budget and I was working on 'it's the thought that counts' kind of vibe. The pattern was from Ravelry by Charlotte W and it looked pretty sweet once I'd finished with it. In return I got two slices of Percy Pig actual birthday cake, so I think I did pretty well. I can't wait for Leanne Leanne to choose what class we're going to so we can plan our girls day out to Norwich; I'm thinking lunch, craft class and a little shopping. Perfect. 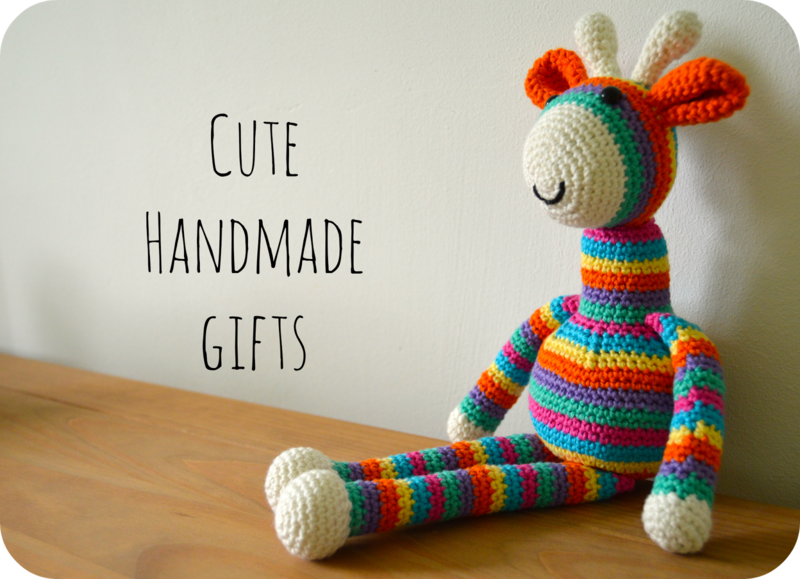 Have you made any handmade presents for anyone? How did they turn out? BEAUTIFUL job Leah!! 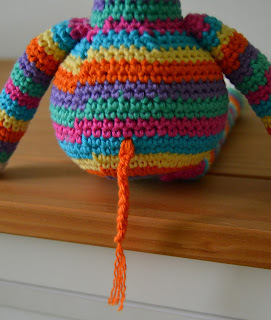 I am attempting this pattern, and prefer your changes. Would you mind telling me how many rows are your altered ossicones? It looks like you started the body with purple (unless other colors are hiding underneath), adding 2 extra rows to the body. Is that right? Also, what size safety eyes did you use--12 mm? Nice post. Thanks for sharing this wonderful art. This is perfect. Corporate gifts are essential part of business. wow IT'S SO Amazing Send gifts to Pakistan . Good post! Thanks for sharing this information I appreciate it. Looking for Luxury Executive corporate gift, promotion gift items supplier in Dubai, Sharjah, Abu Dhabi UAE? Rollupkid is the best corporate gifting company in Dubai. 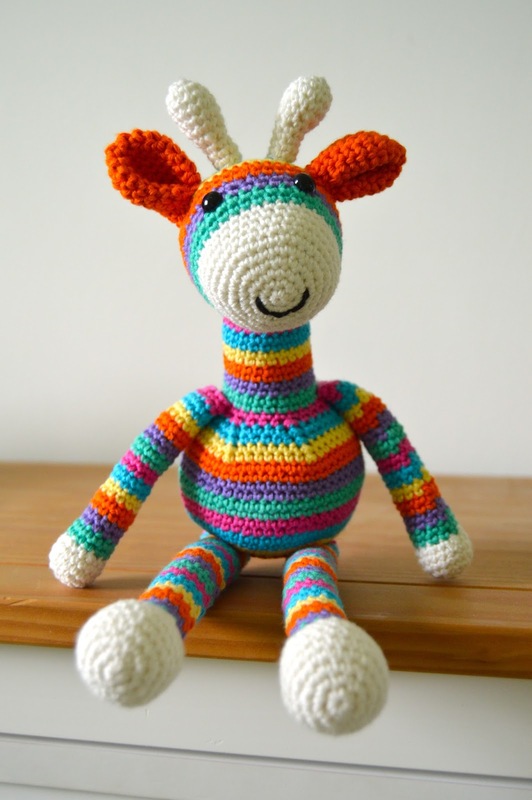 This handmade gift is very cute and fun to give as a exchange gift to my little nephews and nieces. What a amazing idea. It is also a cute unique corporate gifts to give to your female co-worker as well. in Singapore and our established network enable us to source for unique and innovative designs for our customers.